I was recently invited by the very inspiring and extremely skillful quilter Oops-Lah (Vreni) in Singapore to take part in the in Around the World Blog Hop. Please do check out her lovely blog http://oops-lah.blogspot.com/, she is an expert at applique quilting and making beautiful fabric boxes. The blog hop is quite simple: answer a few questions and invite three more people to join in. 2. How does my work differ from other's of its genre? I love working with Kaffe Fassett's fabric the most; there are endless exciting colours and patterns to choose from, and they look hand-painted. 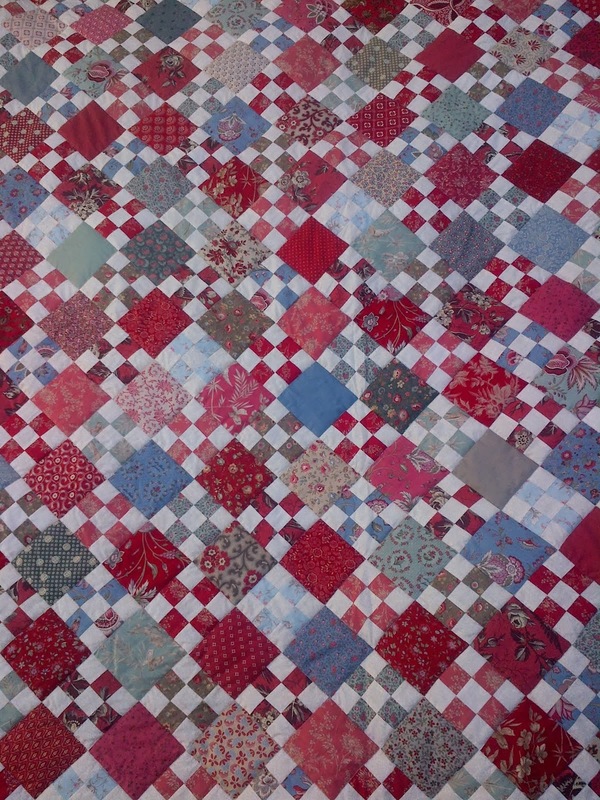 I like my quilt to have a strong underlying structure or pattern (repetition of shapes), so that it has rhythm. I love using as many different prints as possible in a quilt, I think it creates richness of colour and interest. I am strongly influenced by Kaffe Fassett, but I like to use my own colour combinations and also design my own quilt patterns (e.g. 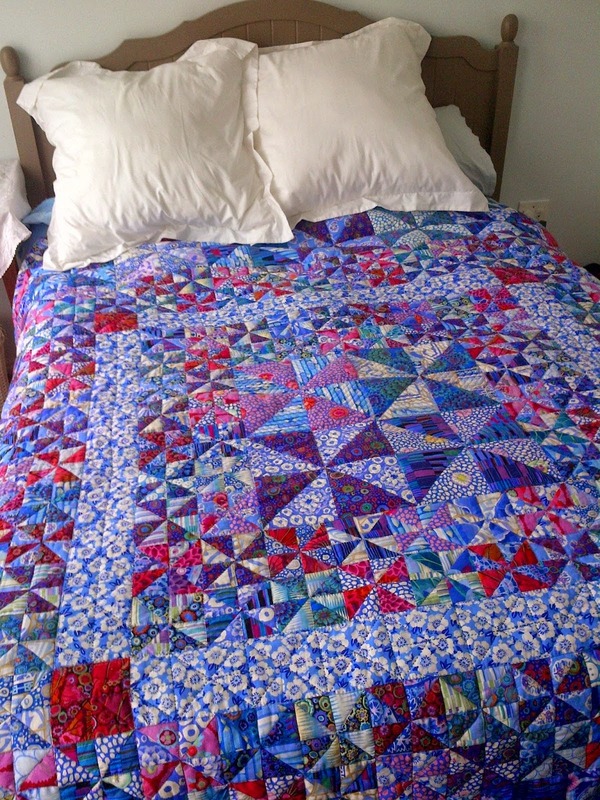 my Water Lilies Pinwheel Quilt pictured below). 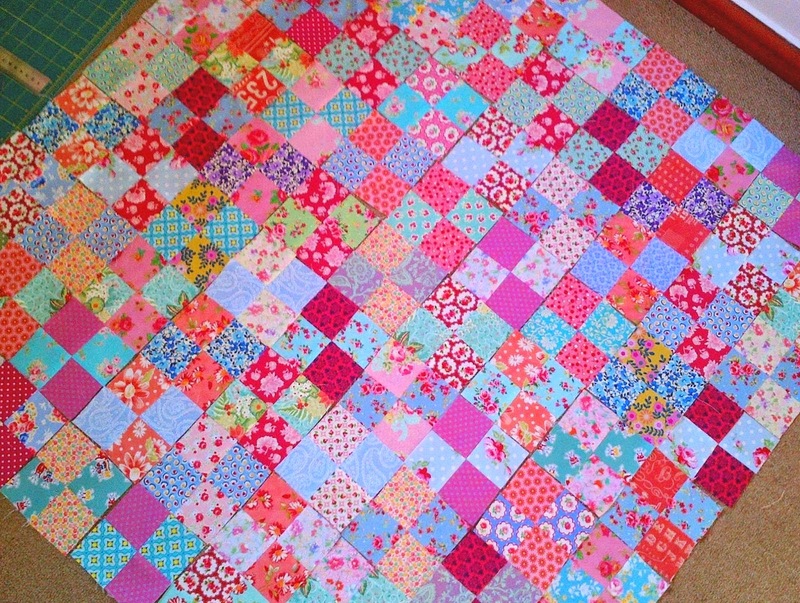 I love to be creative, and quilting really appeals to me because it involves colour, texture and craftmanship. Also, one ends up with something that is functional (and snuggly). 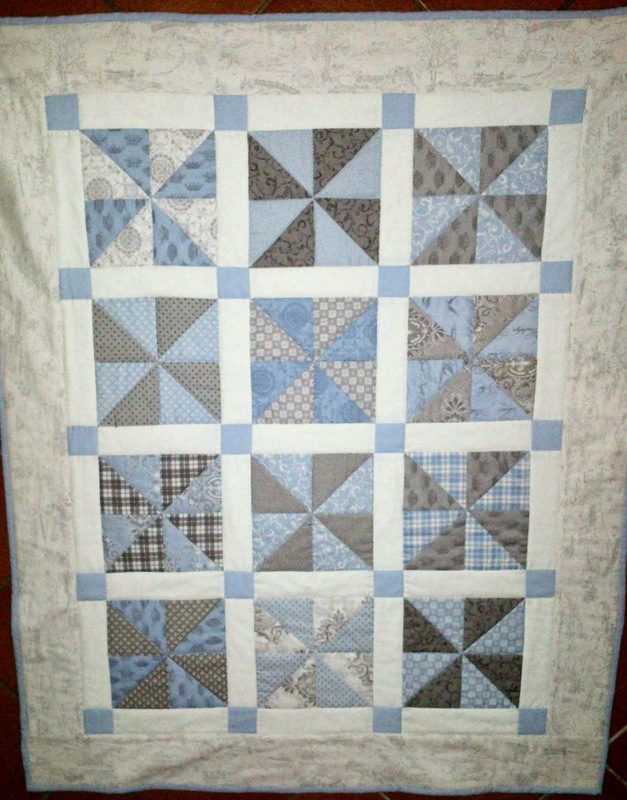 I blog to share my creativity and joy of making quilts. My day job is very logical (soil scientist at a university); so another reason why I find quilting and blogging so enjoyable. I also enjoy other crafts and hobbies such as knitting (see knitted patchwork below), crochet, dress-making, gardening and painting landscapes. I have been knitting and sewing since I was a small child, taught by mom and grandmother. I started quilting in my teens using my mom's scraps from dress-making. I usually start with a quilt block design that excites me (could be from a book, blogs, pinterest or just playing with scraps). Then I proceed to figure our what colour combinations to use to make it pop (e.g. 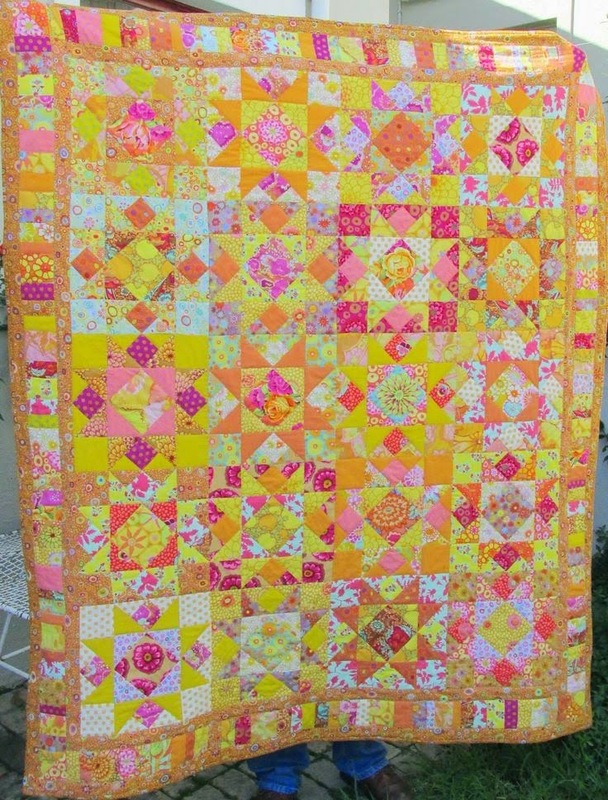 my Summer Star Quilt (pictured below), a happy version of the New Orleans Star quilt by Liza Lucy Prior). Smazoochie (Beth) from Texas, USA http://smazoochie.blogspot.com/ - She is very creative and I love her use of colour and thrift fabrics. Mystic Quilter (Maureen) from New Zealand http://mysticquilter.blogspot.com/ - She has an excellent eye for colour, her quilts are so rich and jewel-like. She is also a Kaffe Fassett fan. Fleur's Place (Fleurette) from Durban, South Africa http://fleuretteellis.blogspot.com/- she makes beautiful quilts using traditional patterns but with modern fabrics and includes embroidered blocks. Excellent post Ailsa! I enjoyed reading about you and your crafts. I don't know why, but I never saw your amazing knitted patchwork "quilt". Wow!! Thanks for playing along and I will certainly visit he blogs you've tagged. 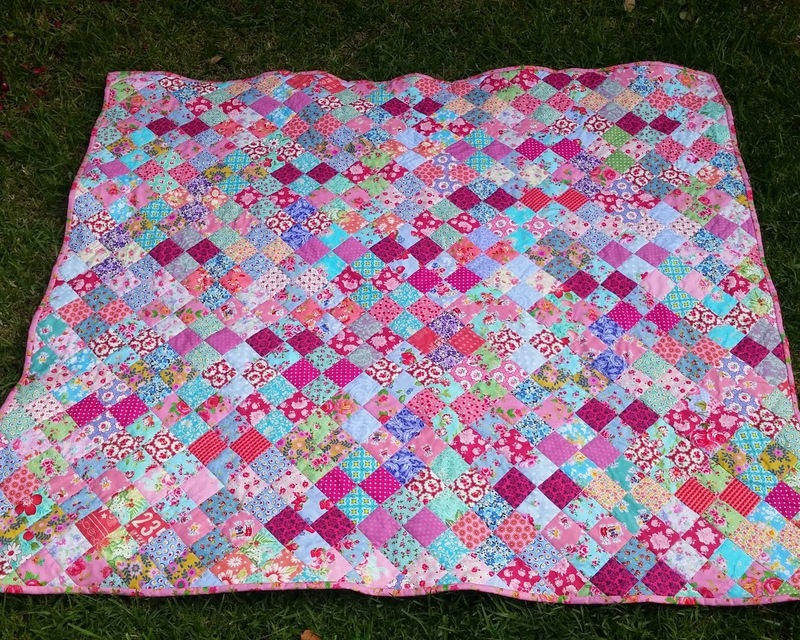 Love your post Ailsa and what a joy to see your knitted patchwork - Kaffe Fassett would be so proud of you!!! Hope we can watch your progress with the Postcard Quilt. Your yellow quilt has inspired me to get busy on my huge stash of yellow - most of them Kaffe and friends fabric. Better get busy on my post for next week! I really enjoyed learning more about your creative approach and seeing some of your early work. Your knitted patchwork is really special and I'm impressed you started a Double Wedding Ring in your teens. Those are beautiful quilts that you've made. 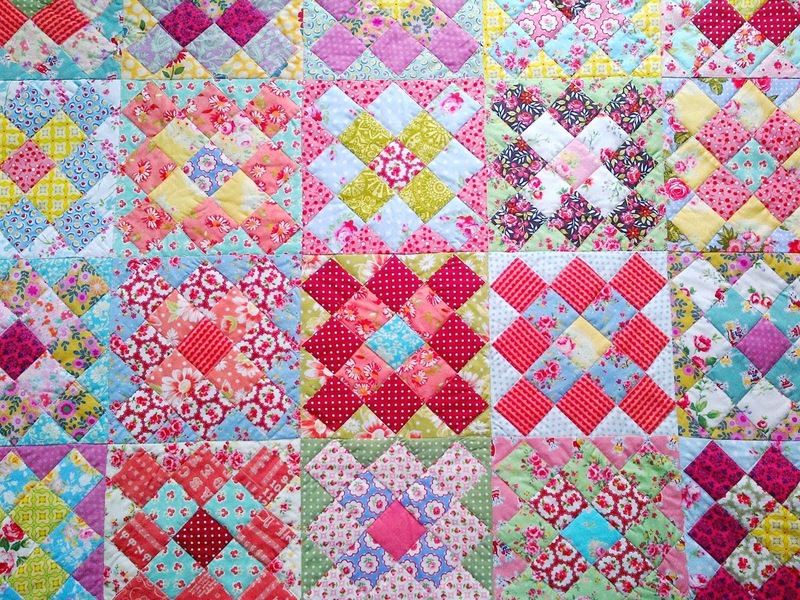 I love the Summer Star Quilt and the pinwheels too. I too spend hours pouring over Kaffe's books and thinking about what to make next. It's been nice to read about your work. I can see your love of colo(u)r & gardening in your quilts. You are so skilled with all variety of needles -- I'm so very impressed by the knitted patchwork. And a double wedding when you were a teen! Thanks for the tag! See you next week! I enjoyed this interview on your creative process and getting to see some of your earlier quilts again. I didn't know your were so ambitious in your teens! Absolutely love your knitted quilt. I will look up the other blogs! A lovely post Ailsa. Summer Star is gorgeous and I love your knitted patchwork and looking forward to seeing your progress on the Postcard quilt. Thanks for tagging me. Loved reading this. Your knitted patchwork is such fun!! You make beautiful quilts. Wow just love how you have put all the lovely colours together. I still have a problem which I am slowly but surely solving with the use of putting together a combination of prints. Thanks for sharing. 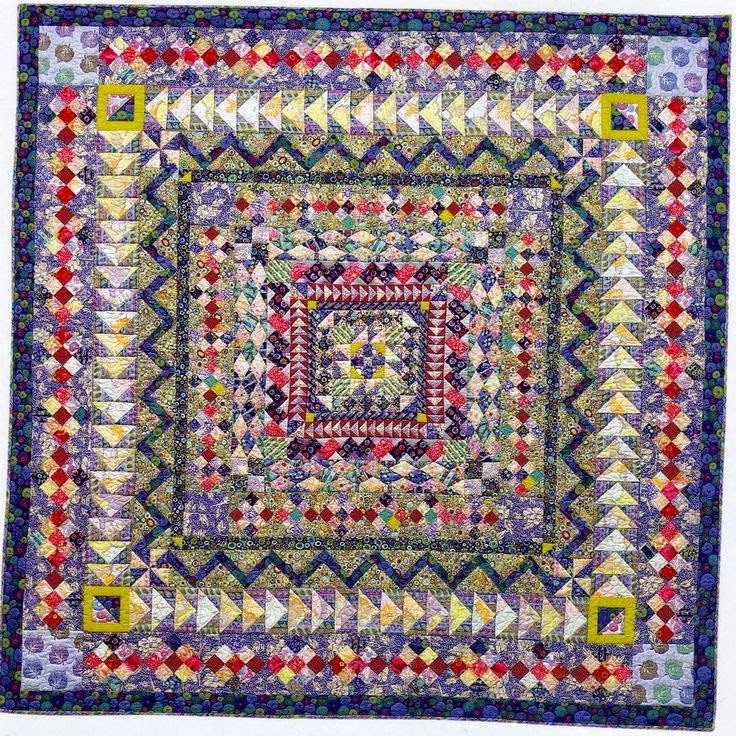 Wow,ich habe neben mir das Buch von Kaffe Fassett "Quilt Road" und würde diesen wundervollen Quilt auch nähen. Dein Quilt sieht wunderschön aus!!!! 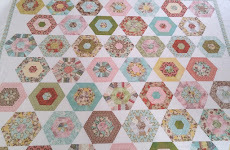 I wood like to sew also this wonderful quilt-all your quilts are so lovly!! !